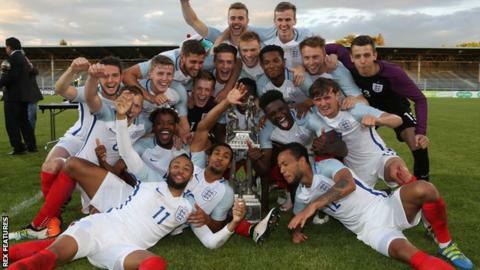 England Under-21s at the 2016 Toulon Tournament celebrate their first tournament victory since 1994. He was once compared with Glenn Hoddle and he has shone in England shirt under Gareth Southgate. Now Matt Grimes has come of age at Swansea City. It has taken a while. Grimes joined Swansea from Exeter City in January 2015, jumping from League Two to the Premier League in the process. It has been worth the wait, however, with Grimes a leading contender to be named Swansea's 2018-19 player of the season. The 23-year-old has had to cope with setbacks along the way, but has matured into a Championship player of some distinction. Not only that, but the consistency he has produced this season suggests he has the quality to step up to the Premier League at some point down the line. Should he make it back to the top flight, Grimes would find himself rubbing shoulders once more with some of England's finest young talents. In the summer of 2016, he was part of the England Under-21s side who won the Toulon Tournament under Southgate's management. Alongside him in the squad were the likes of Jordan Pickford, James Ward-Prowse, Ruben Loftus-Cheek, Nathan Redmond and Ben Chilwell, all of whom have since become senior England internationals. "It was great to work with Gareth Southgate and to play with some of the best talent in the country," Grimes tells BBC Sport Wales. "You see lads (from that squad) now playing in the Premier League and making their senior England debuts. "Obviously they are ahead of me at the moment, but playing every week this year has given me confidence to look up rather than down and think: 'Why can't I be in their position?'. "I have got a long way to go and I need to keep working hard and playing well for Swansea, but I have played with some of the best young talent in the country. "I look at them now and think: 'Why can't I be there?'. It's down to me to work hard and prove I can be." Swansea manager Graham Potter recently stated that he believes Grimes has the quality to return to the Premier League. Jimmy Floyd Hasselbaink, who had Grimes on loan at Northampton last season, is another big fan. "Technically he is very, very good," the former Chelsea striker says. "He knows the game and he is hungry. He has the stamina for modern football and he is a good boy to work with. "He needs to be in a team that plays football - a passing game - and at Swansea he is at the right place." It was Southgate who gave Grimes his first England Under-21s call in the spring of 2016, when the midfielder was on loan in the Championship with Blackburn. In Toulon that summer, Grimes played in wins over Portugal, Guinea and Japan en route to the final, when England beat France to claim the title for the first time since 1994. After that triumph, Grimes is unsurprised by the success Southgate has enjoyed with England's senior team. "He is a top manager - he was back then and he is now," Grimes says. "It's hard with international football because you are only together for a week or so at a time, but he was brilliant man management-wise. "Stepping into the group I felt really comfortable. He put his arm around me and made sure I was all right. His tactical understanding of the game and the way he set us up was first class. "I wasn't surprised at all when they gave him the [senior] job. He did so well with the under-21s that I thought it was only fair they gave him a chance. "He has repaid them. I think everyone can agree he was the right man for the job." Grimes was still an Exeter player when his potential was recognised by England. He was an under-20s international when he left the Grecians aged 19 to join Garry Monk's Swansea. Signed for £1.75m, Grimes had three Premier League appearances to his name by the end of 2014-15. His progress slowed in the following campaign, hence the move to Championship club Blackburn. Having played 13 times for Rovers, Grimes hoped to get a full season of second-tier football under his belt when he joined Leeds on loan for 2016-17. Matt Grimes made 12 appearances for Leeds in 2016/17, with his last game being a 1-0 FA Cup defeat against non-league Sutton United. Yet he made just a handful of appearances at Elland Road under Monk, the former Swansea boss who had taken him north. "Leeds probably wasn't a reflection of what I can do and I'm sorry it worked out the way it did," Grimes says. "I don't feel good in myself that I went there and failed, but I feel like I have taken the positives and bounced back quite well." The Leeds experience was a blow for a player who was so highly regarded at Exeter that then director of football Steve Perryman, a Tottenham legend, said he had never been more excited about the emergence of a young talent. As Perryman pointed out, he had also witnessed Hoddle's emergence at Spurs. "Stevie P was brilliant with me at Exeter. What a role model," Grimes says. "To grow up having him around the training ground is more than you could ask for as a young player. "I am very grateful to him for what he did for me. Any comparisons and praise like that you will take, but you have to try to keep level-headed." Grimes has no problems on that score. Those who have worked with him all mention his attitude and professionalism. His willingness to put in a shift was in evidence in 2017-18, when he played 47 times for Northampton having dropped into League One in search of game-time. The Cobblers ended up being relegated, yet Grimes emerged with credit and returned to Swansea a better, stronger player. "Coming back this pre-season, I thought: 'This is the time where I am going to have to break into the team'," he says. "Thankfully the manager has put his faith in me and I couldn't be happier with how it's gone. "I just want to keep building now. I know there is more to come from me and more to come from the squad." It has not been an easy season for Swansea, with the financial consequences of relegation from the Premier League casting a shadow across the club. But under the guidance of Potter, Grimes is one of a host of youngsters whose performances have offered hope for the future. The likes of Connor Roberts, Mike van der Hoorn, Daniel James and Oli McBurnie are among Swansea's player-of-the-year contenders, but Grimes is arguably the favourite. Whether he is deemed Swansea's standout performer or not, Grimes admits it is good to feel loved at the Liberty right now. "I try to keep away from stuff like social media because I have had my fair share of stick over the years," he says. "All you want as a football player is to go out, play for the shirt and enjoy your football. "Hopefully then you are liked at a club. I don't think I have felt that for about four years, so it is a nice feeling."